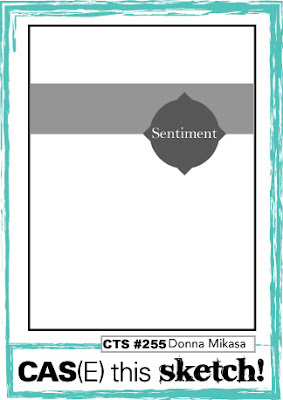 make a baby card for a friend in my Bible study. This made me get it done! 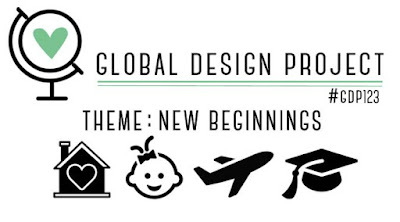 to play along with the New Beginnings theme. images in Memento Tuxedo Black on Whisper White. 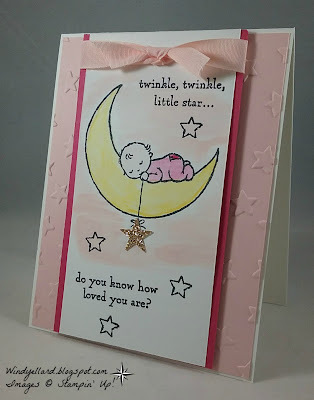 I washed a little Powder pink ink around the baby/moon. I added a small punched glimmer gold star for bling. over the star embossed piece of Powder Pink. 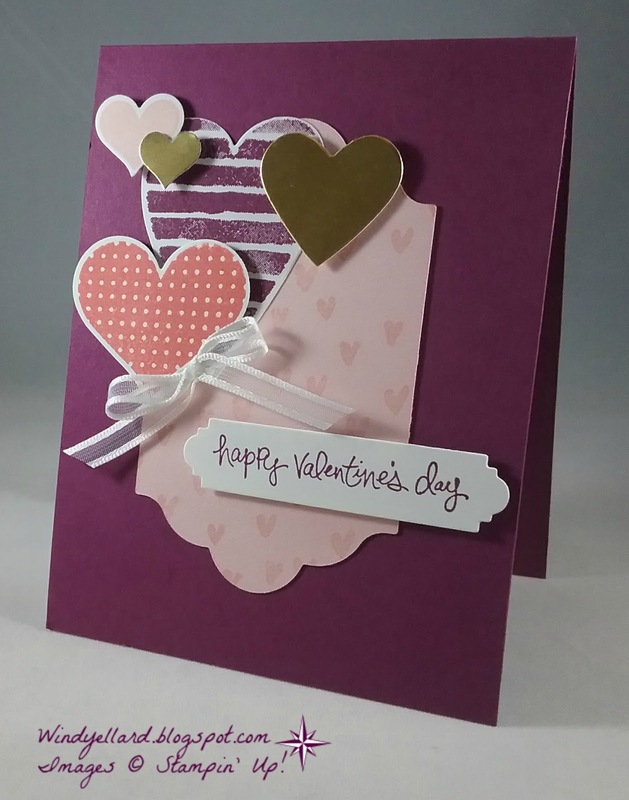 The base is thick Whisper White card stock. I added the Powder Pink ribbon to finish it off. 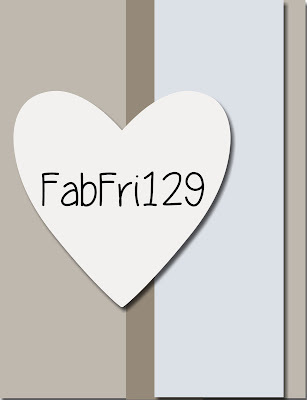 Hope you have a fab day and thanks for stopping by! Stampin Blends markers weeks ago but just now using it. I cut the scene out with a Layering Oval framelits die. order with SU! and it is in the new 2018 Occasions catalog. and Daffodil Delight blends when coloring. I also cut a detailed die from the Flourish thinlits dies in Old Olive. I layered all this on a piece of Delightful Daisy DSP. Love the fade or ombre look of the paper. I finished it off with the Soft Suede base. 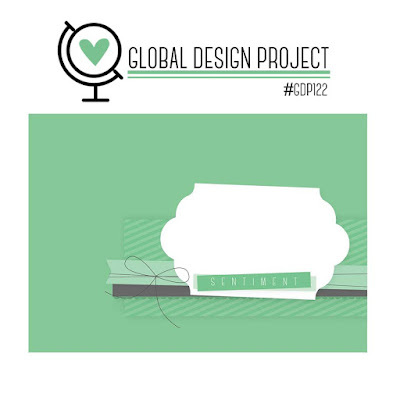 I thought of the hearts before I even saw a design team idea. 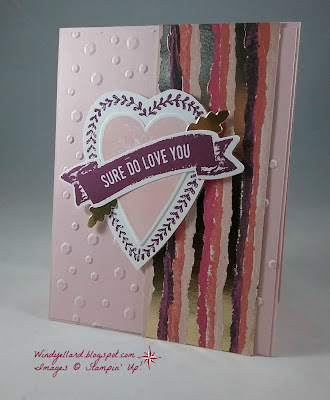 I stamped the heart from Sure Do Love You set 5 times in different colors. 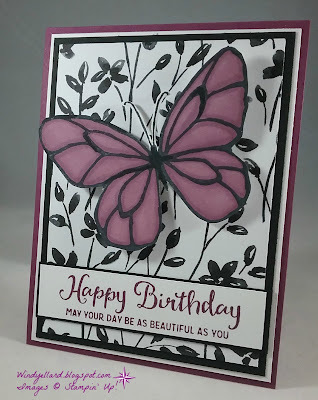 from same set stamped over it in Berry Burst. Whisper white and then a Berry Burst card base. Paper Pumpkin kit this month so I finished it off with some of those. I picked the bottom row of Sparkle, Love, Free! and gold sequins for my sparkle! And hearts for my free space because I love hearts! already there making it so easy to make special. 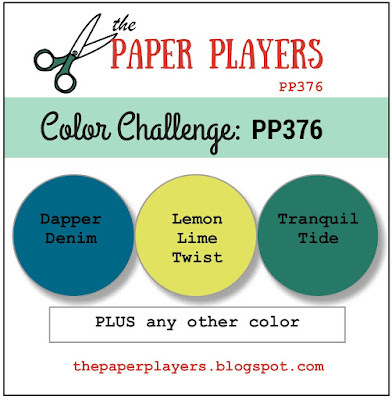 I layered it on Calypso Coral and then a Whisper White base. emboss folder for some texture! 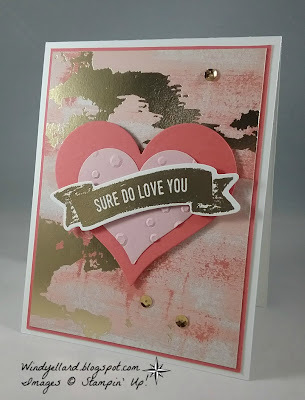 I heat embossed the sentiment in gold and cut it out with the matching die. I added the sequins from the metallic sequin blend to finish it off. FMS321 A Just For You Soiree! Love the Sweet Soiree suite! in the Occasions catalog along with this suite. I thought the silver would look awesome on the Marina Mist card stock. from the embellishment kit along with the two vellum stems. Whisper White. The sentiment is from the Sure Do Love You set. 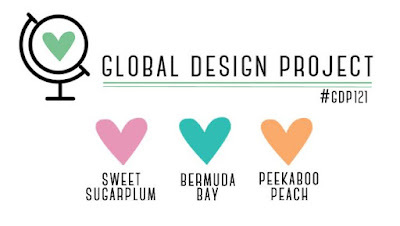 I started with the beautiful DSP called Sweet Soiree Specialty DSP. which I then layered on a Smoky Slate base. piece behind and added a white doily half behind that. 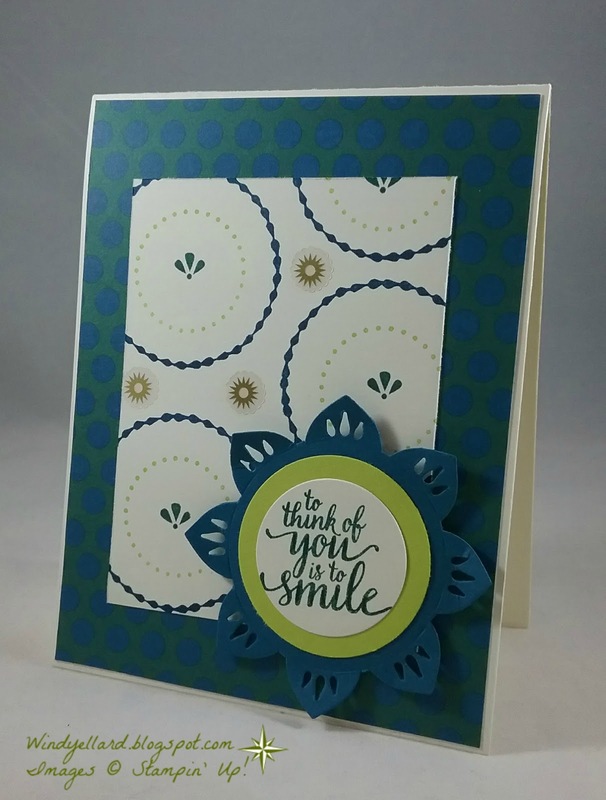 from the Sweet Soiree embellishment kit. Petals & More thinlits dies layered under those. and added a small pearl. 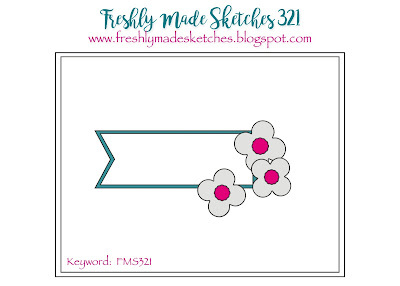 stamped in Calypso on white card stock. 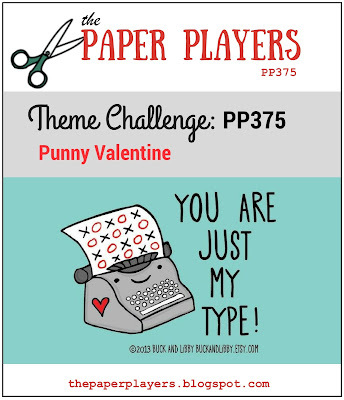 PP377 I Love You Hearts! I do not know why my picture seems a little light and fuzzy. But maybe it is cool! Razzleberry card stock and then on a thick Whisper White base. 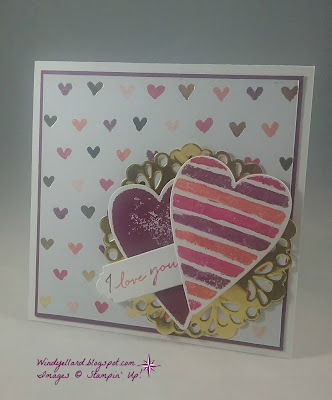 I placed a gold foil doily behind the two hearts cut with the same die. 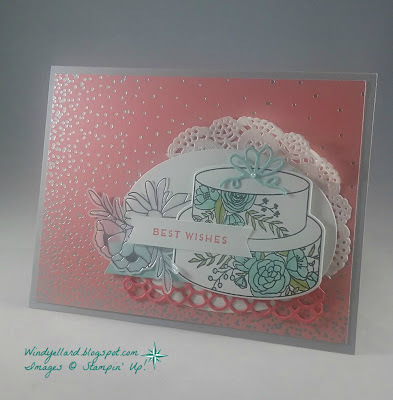 from Happy Wishes- a Sale-a-bration stamp set you can earn free. The You is from the same set but a different stamp. I cut them with the label die from Petals & More thinlits dies. 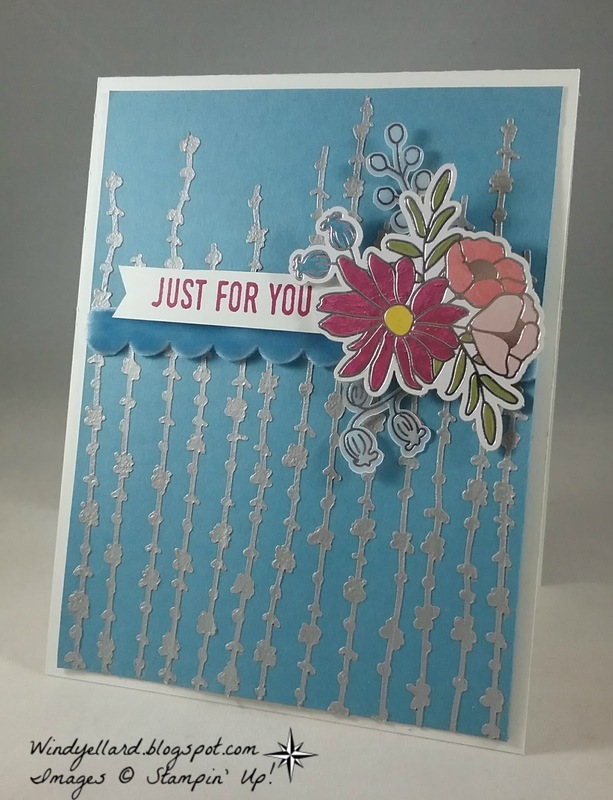 every 50.00 you spend on Stampin' Up! products! Hope you can play along and thanks for stopping by today! 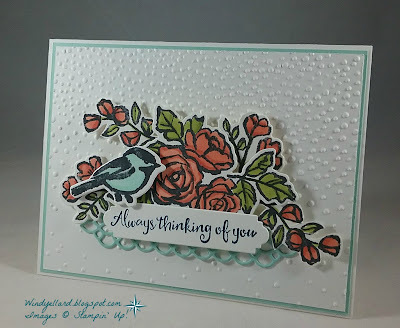 on thick Whisper White card stock and used my Stampin Blends to color. 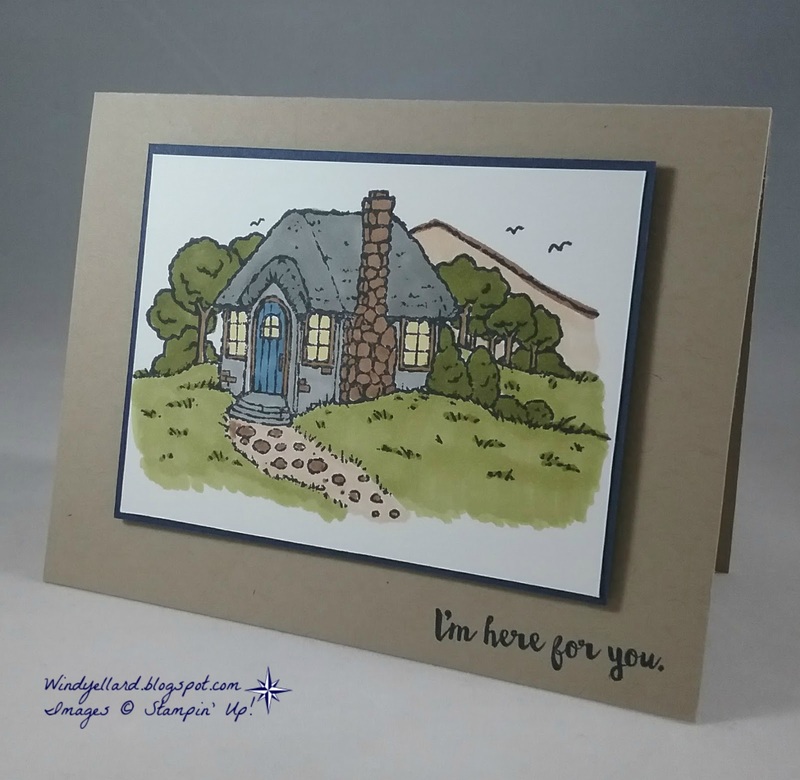 sentiment from the Here For You set stamped in Navy. I will color this again and add the gate stamp, too. I just sent this card off to my mom! which has gold foil running through it. I ran with the Scattered Sequins emboss folder. I then layered those on a Powder Pink base. is no die for that heart from Sure Do Love You set. It looks bad close up but ok in the photo! which match the Sure Do Love You set. with the same framelits dies for more bling. I keep trying to hoard this paper and making an effort to use it up. Looking forward to making more projects with it. 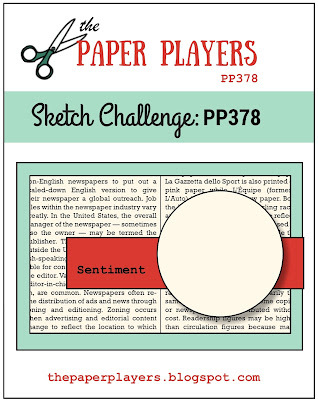 Paper: Powder Pink, thick Whisper White. promotion going on now thru March 31st. I decided I wanted to use the baby wipe technique when inking this one up. drops of re inker from Wisteria Wonder and Wild Wasabi to use as an ink pad. in Elegant Eggplant. I used a circle die to cut it out. 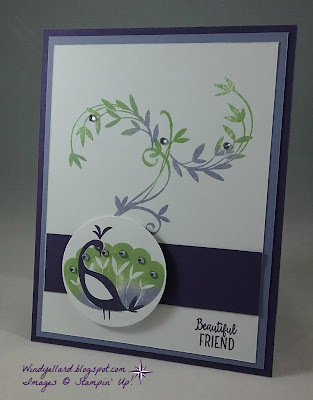 I stamped the leave flourishes with the new ink pad on the background. I stamped the sentiment from the set in the bottom in Eggplant. I then layered the background on Wisteria Wonder and then an Eggplant base. Hope you can play along, too. TTTC031 Floral Heart Just For You! 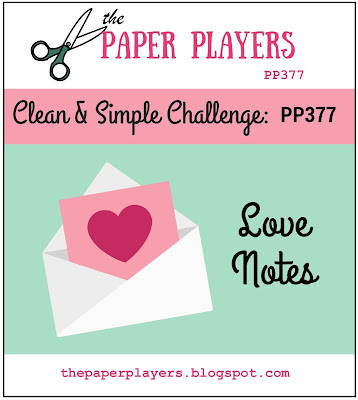 I picked the first column for this challenge- Pink, Doily, Sequins. over to my friend Peggy Noe's blog for inspiration--she is the queen of doilies! my aqua painter in Berry Burst, Powder pink and Pear Pizzazz. I cut it out with the Sweet and Sassy framelits dies. layered with Powder Pink card stock and layered it all on a Berry Burst base. from Sure Do Love You set in Berry Burst and cut it apart. Play along and thanks for stopping by! FMS320 Happy Sweet Soiree Birthday! 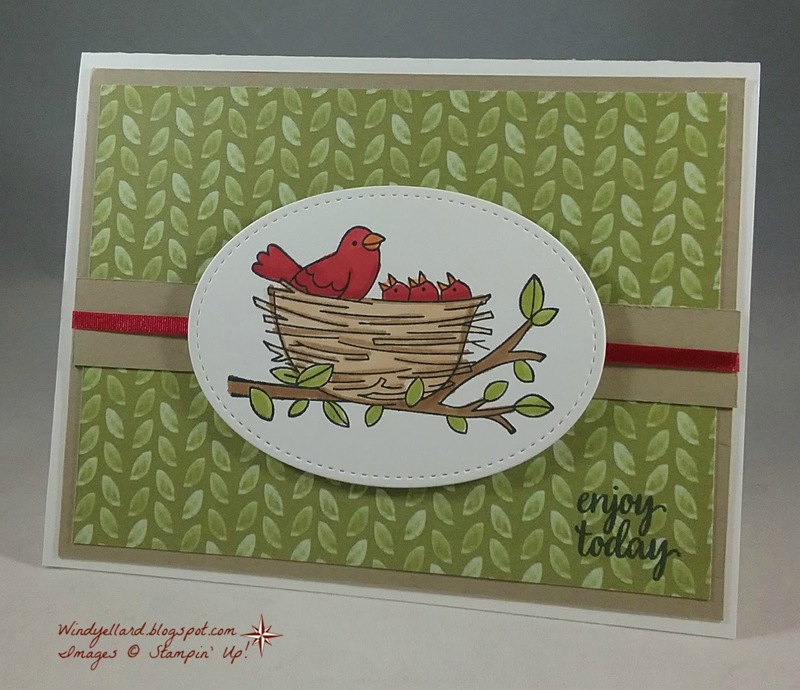 and used the matching die cut but had not placed on a project yet. This was the perfect sketch for it! I used a base of Powder Pink cut 4 1/4"square. 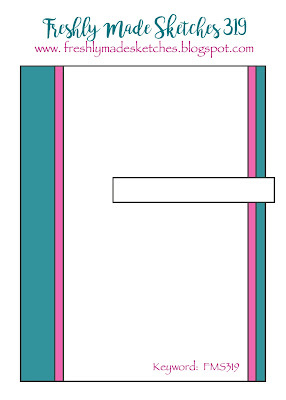 I cut the piece of Sweet Soiree DSP an 1/4" smaller. I took a white oval I had on my desk and hang it a little over the DSP and cut it off. matching dies. Love the Berry Burst bow on the top of the cake. with a half of a sentiment from Cake Soiree. I used my Berry marker to ink up just the part I wanted to stamp. sentiment and the bow and it is a beautiful birthday card! Amazing You and the matching dies called Celebrate You. banner which I ran through with the Hexagon emboss folder. the emboss folder with Bermuda Bay ink. ink and the sun spray stamp top and turned it over and did again. 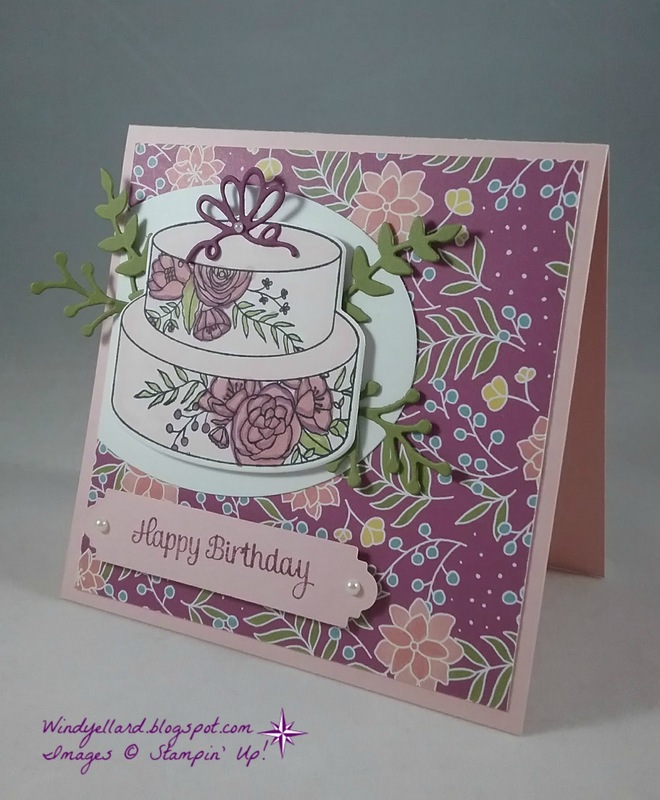 I stamped the base with the flower in Sweet Sugarplum ink. I punched out the leaves in Peekaboo Peach with the leaf punch. I layered the Amazing die in Sweet Sugarplum card stock. I finished it off rhinestones for bling. and stamped some circle and a cute little fan in the middle. and then a Dapper Denim Eastern Medallions thinlits dies. from the Eastern Gold Vinyl stickers. Beautiful Day but this time I colored it in Pumpkin Pie. Not one of my fav colors so I used do not use it much. 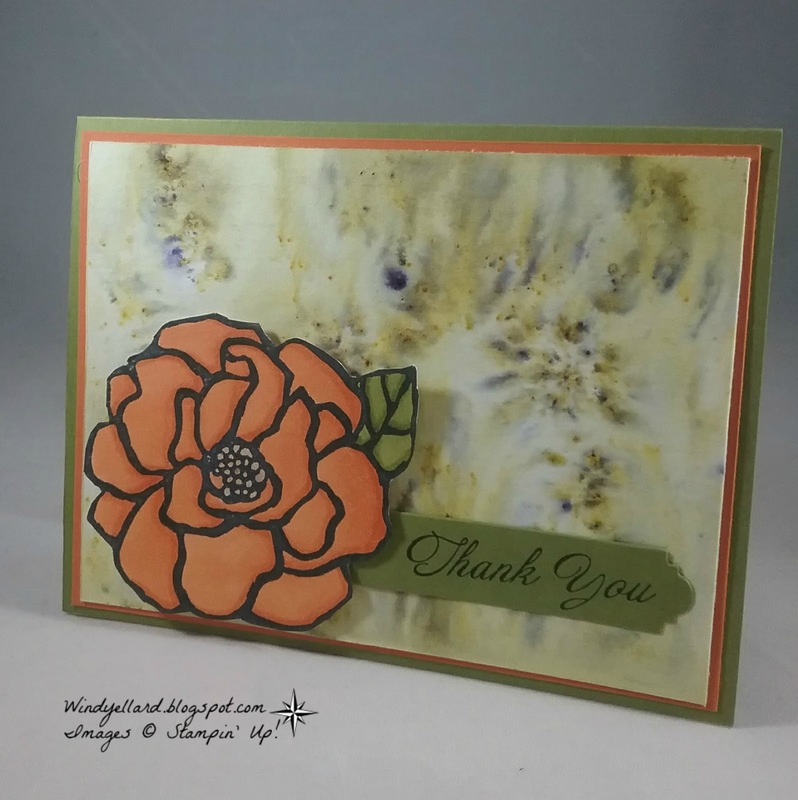 I colored the leaves Old Olive and the center of the bloom with the Ivory blend. I hand snipped it out to pop up on the Brusho Background. I then decided it needed the Moss Green Brusho Crystal Color background. sprayed lots of water and watching them run. 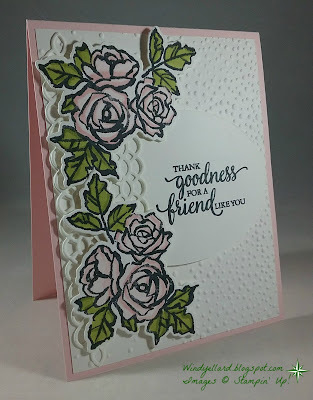 I stamped a sentiment from a sale-a-bration set called Heartfelt Blooms. cut it out with a die from Petals & More thinlits dies. I see myself using that die a lot! I sat and thought about the sketch for a long time. shapes I then grabbed my new Heart Happiness set and went to town! because it is all hearts and several sized plus prints. My favorite one is the striped water colored large one. 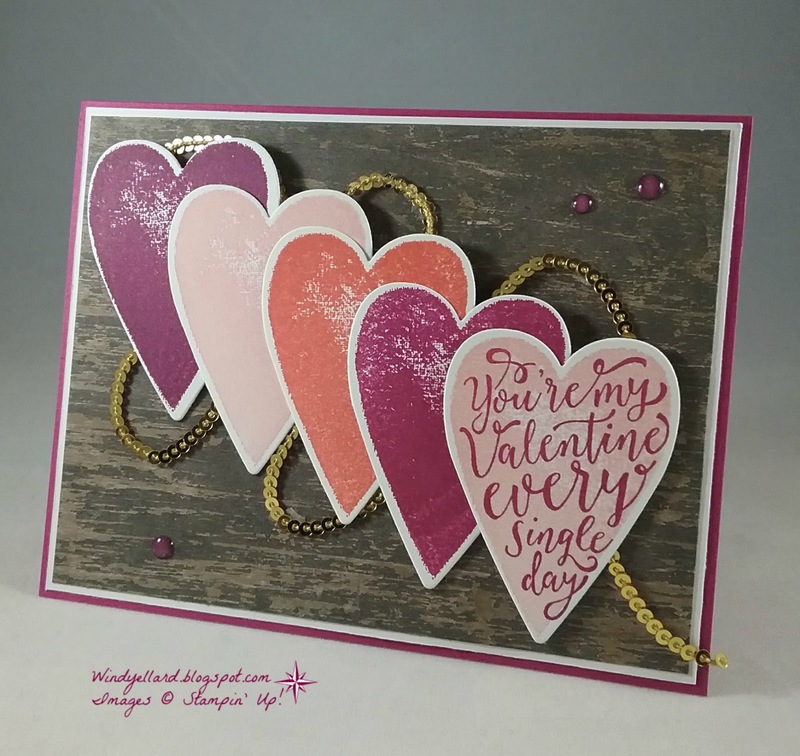 I used Calypso Coral, Powder Pink, and Rich Razzleberry inks. Added some gold foil hearts for bling. with the label die from Petals & More thinlits dies. The sentiment is from a retired set called Good Greetings. I kept it for this set because it had the sentiment in it. I also love the script, too. I went diagonal with Vintage, Lace, and Purple. Elegant Eggplant which looks like vintage blooms. Petals &More thinlits dies and added it to the bottom for lace. Maybe a sketch but it I think it did make it look more vintage! 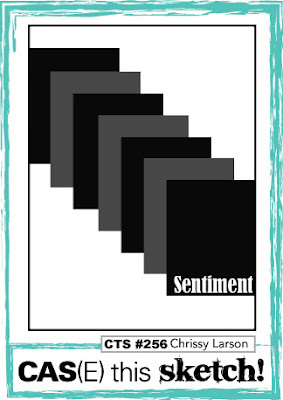 Love the script on the sentiment fro the same set. I added some pearls to finish it off. 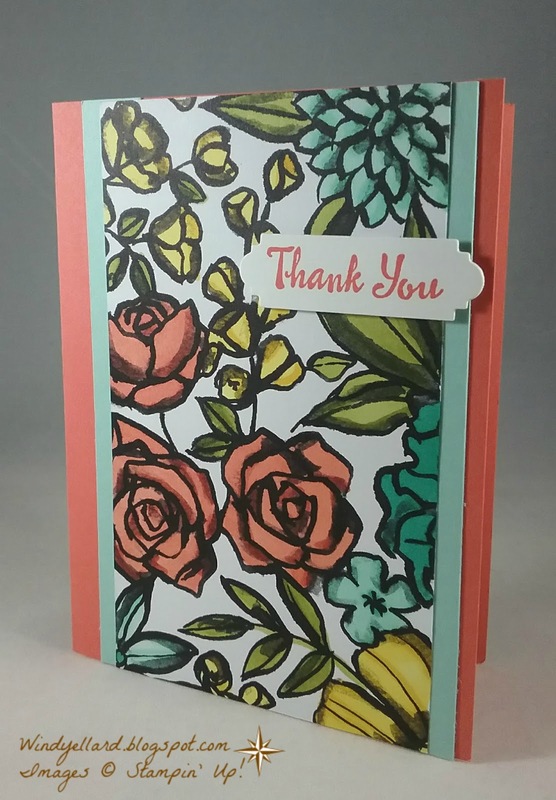 I love coloring this DSP from Petal Passion DSP pack. 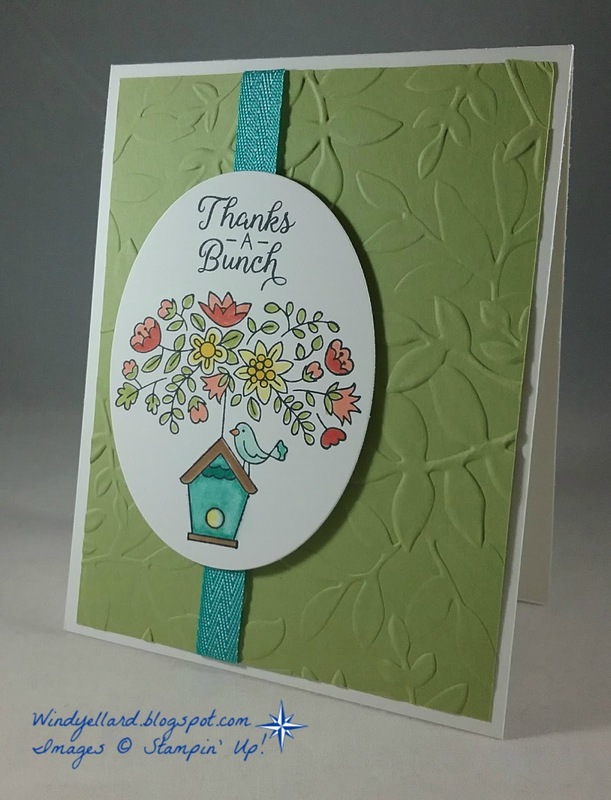 I used several Stampin Blends markers for this blend job. Pool Party, Bermuda Bay with Old Olive leaves. for the sketch and a Calypso Coral base. 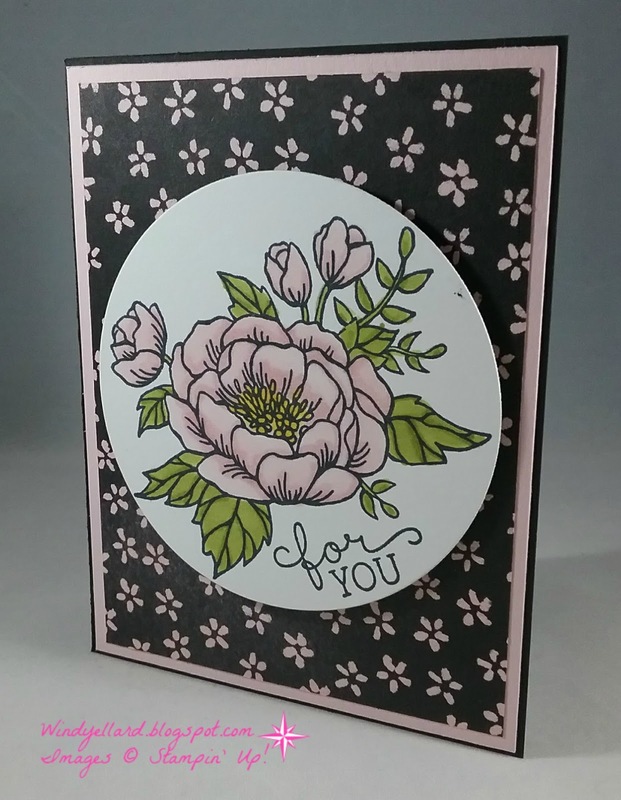 and cut it with the label die from the Petals & More thinlits dies. Quick and easy but so much color! 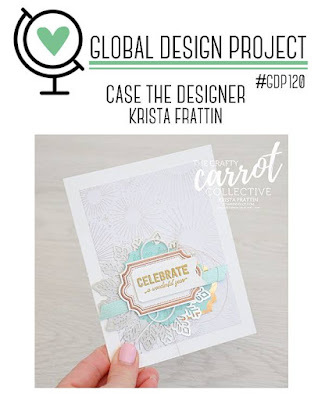 I mostly looked at Krista's sketch and thought of my Cake Soiree suite! leaves are from the kit. right in the print. I placed it on a Smoky Slate base for pulling out the silver. silver bakers twine around but it is kinda of hidden. 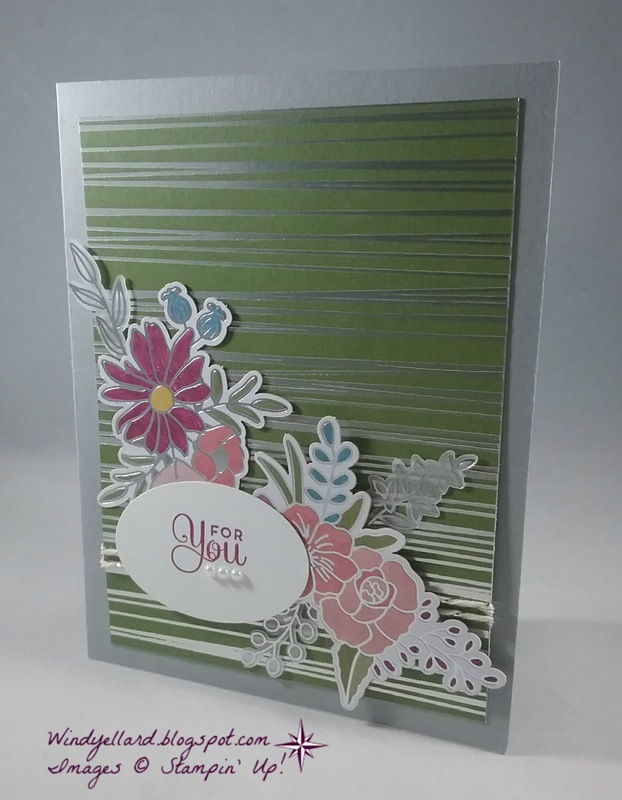 with the silver foil and the beautiful flowers! on the Pool card stcok- Seaside emboss folder! 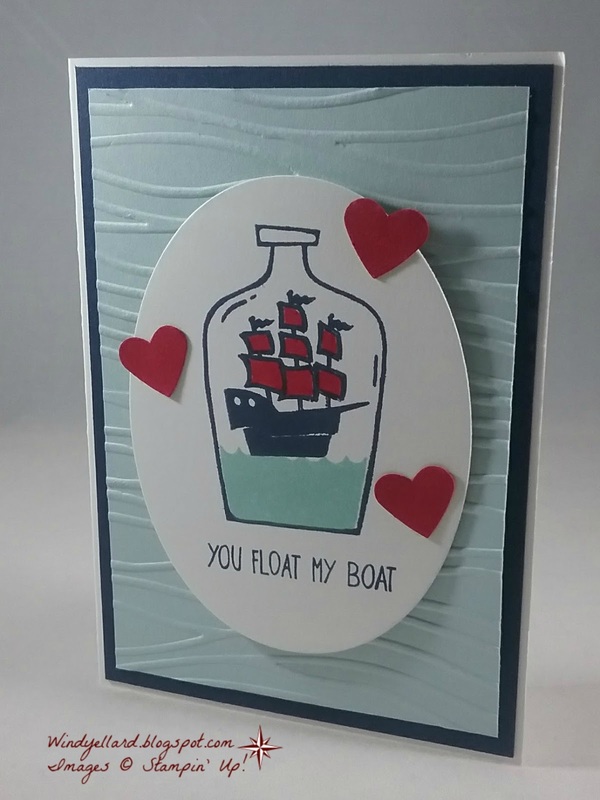 the Message in a Bottle set in Night of Navy on a white oval. with my Real Red marker. I just had to add some red hearts from a retired punch to finish it off. Old Olive, Cherry Cobbler, Crumb Cake, Pumpkin Pie and Ivory. I cut it with the Stitched Shapes die in an Oval. and then some Delightful Daisy DSP...love the leaves! a bit of Real Red 1/8" ribbon for a pop of red. plus the Daffodil Delight in the middle. 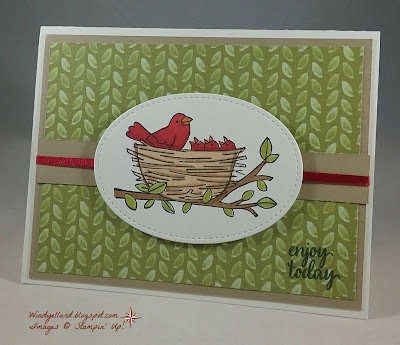 I stamped the sentiment after cutting the image with the Circle die. 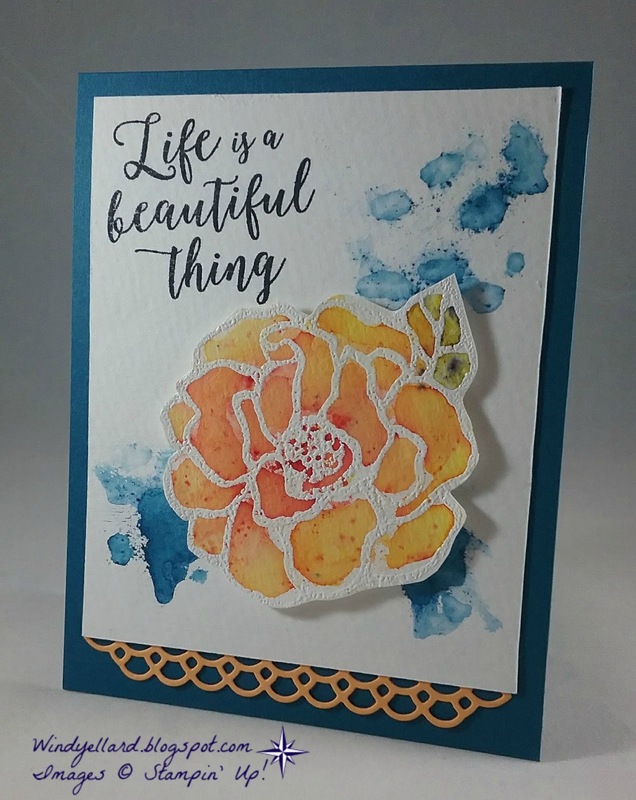 with a sponge brayer to color the flowers. I layered it on pink and then a black base. I did get a smudge on the side of the circle after attaching. Well, it is hand made! Thanks for stopping by and have a exciting Wednesday! 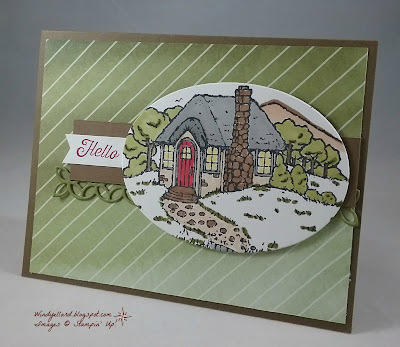 and colored it with Stampin Blends in Rich Razzleberry. and some layers because placing on the Rich Razzleberry base. 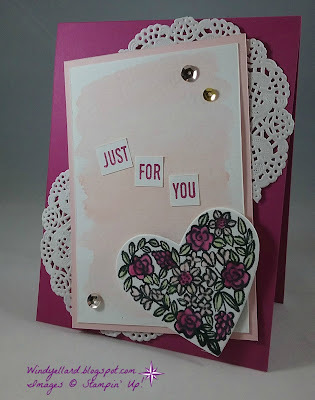 I stamped the sentiment in Razzleberry to finish it off. 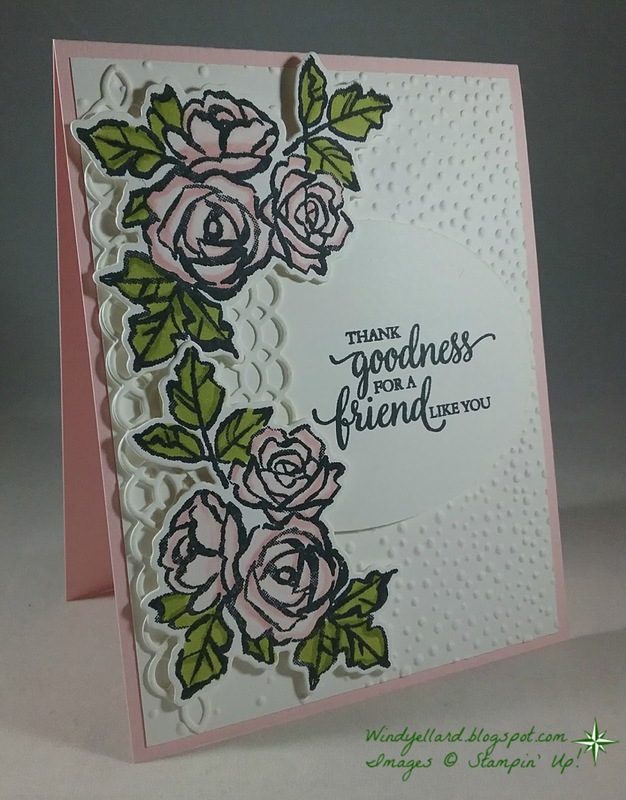 More roses to color with my Stampin Blends! roses and Pool Party for the bird. 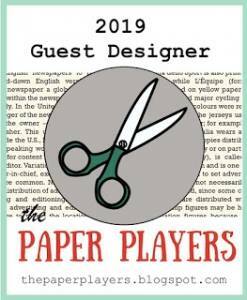 and cut them out-one with the die but the other by hand. with the Softly Falling emboss folder. and used a die from the Petals & More thinlits dies. The same dies were used for the detailed die in Pool Party under the sentiment. on the Whisper White base. So pretty with the Coral and Pool! 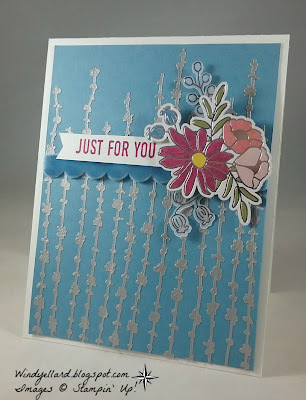 I used the top row across Stamping, Die Cut, White for the challenge. 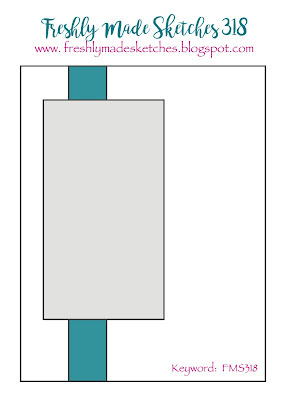 Hope you can play along at tictactoechallenge.com this week. and loved the Pink Pirouette color for the softness. I used the Pink and Old Olive to blend. I then cut them with the matching die. 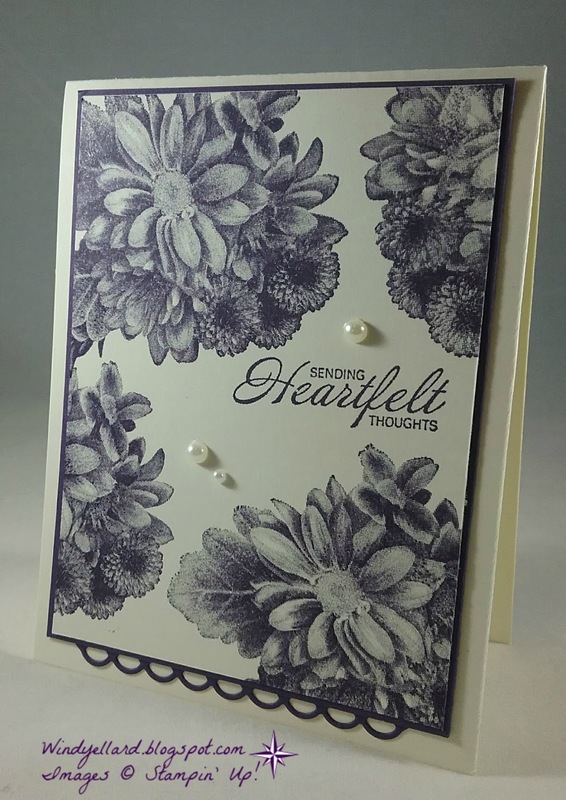 a white card stock background embossed with the Softly Falling emboss folder. I stamped the sentiment from So Many Shells on a white oval to finish it off. I like the softness of the card! and then colored them with my Stampin Blends. I used several colors on this fun floral image from Flying Home. 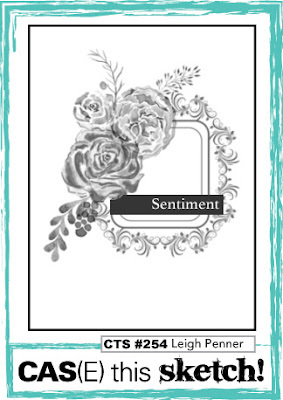 I added the sentiment from Beautiful Bouquet. the sketch before adding to the thick Whisper White base. I would place on it. Crystal Color on and let it sit for about 15 mins. It was still wet but then blotted it with a tissue. Love the splashed water effect. in Memento Tuxedo Black from the Colorful Seasons set. since I had cut the background an odd measurement. to cut the detailed die from Petals & More thinlits dies.